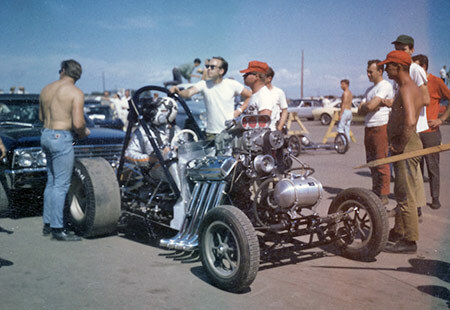 In the early 60's two young lads, Brent Seaman and Gary Egbert were drawn together through a common interest in hot cars. 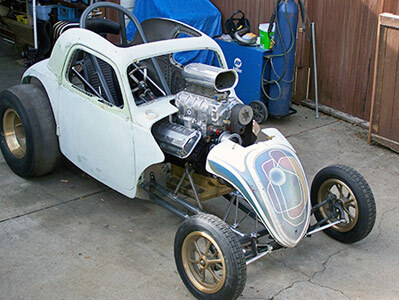 Almost finished high school, the pair dragged Gary's "T" hot rod to various speed contests around Edmonton. 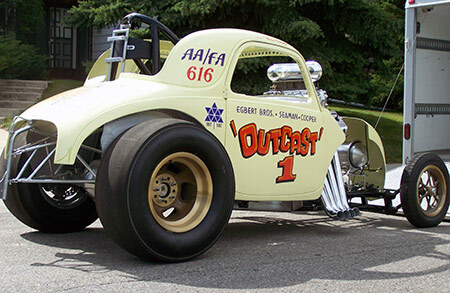 The "T" had a souped Olds engine, a 39 Ford transmission with no first gear, and a set of racy Inglewood drag slicks to put all that power to the pavement. 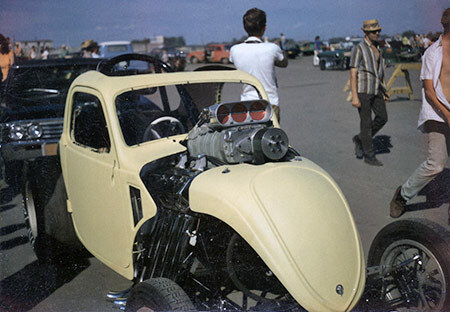 During the summer of 1963 the duo made a trek down to Deer Park Raceway in Spokane Washington. 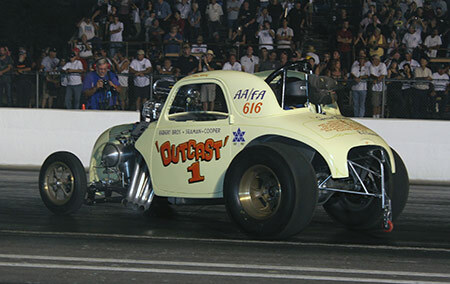 Featured was a match race between Don Garlits and the Thrifty Auto Supply AA/FD. 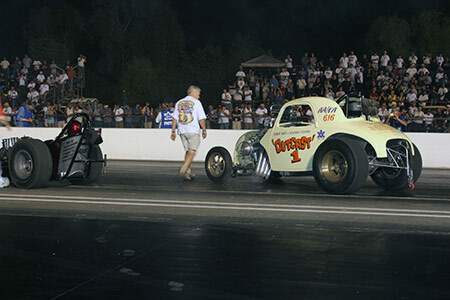 Although all the other cars were neat, the noise, smell, and thunder of the fuel dragsters bit the pair hard. 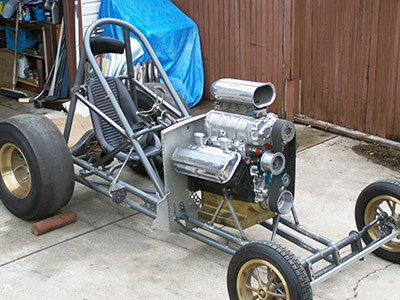 Since Brent had a 49 fiat (which he bought for $75) and fiat altereds were all the rage, a plan was put into motion. 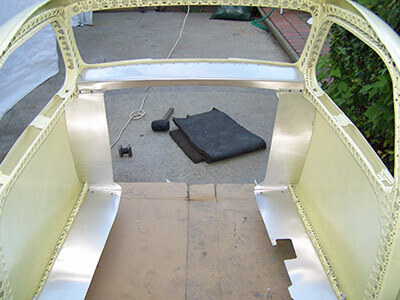 The little fiat was stripped and construction began. 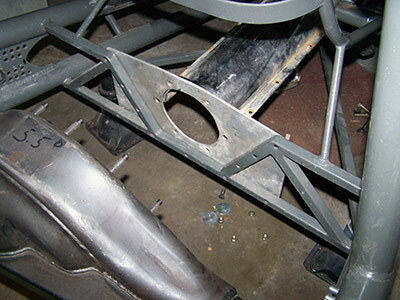 With Brent doing a lot of grinding and Gary doing most of the fabrication the result was a show quality chassis. All the welds were ground smooth and filled, legal then, but definitely a no-no now. 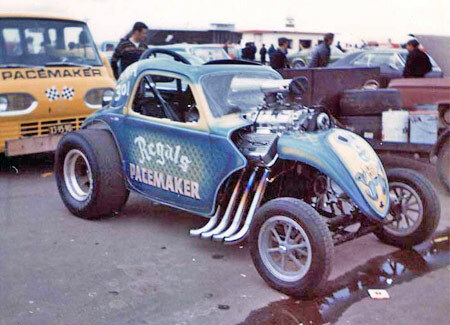 Initially, the plan was to use the Olds out of the "T".However, as is the case with drag racers, the plan which was to step up gradually soon turned into a blown fuel altered. 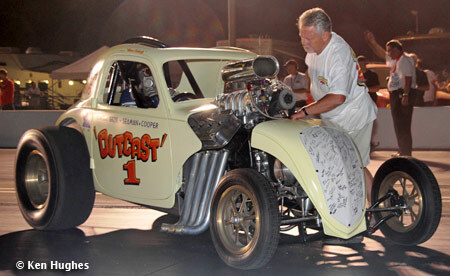 Gary scrounged up a 6-71 and wanted to put the blower onto the Olds. 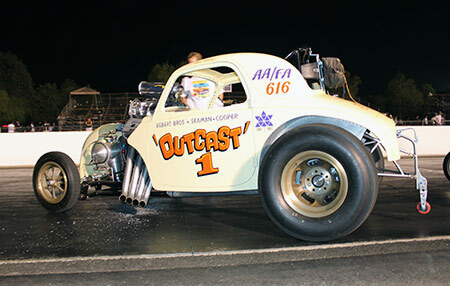 Brent thought better of this and persuaded Gary to go with a Chrysler hemi. 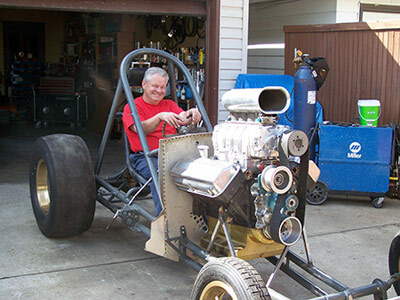 At the time Keith Black was making a name for himself with the Greer-Black Prudhomme dragster, so Brent thought, this was the best person to contact and order parts from. 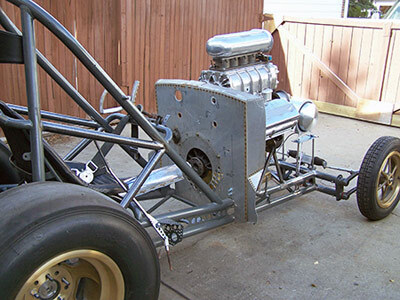 The result was an engine with the best parts available; forged true rods and pistons, Enderle fuel system, and a Schiefer ignition system. 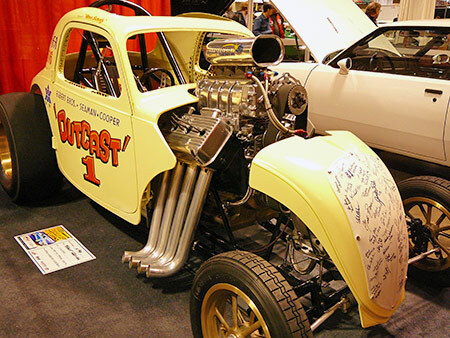 After countless hours, the little yellow fiat was ready for its maiden voyage. 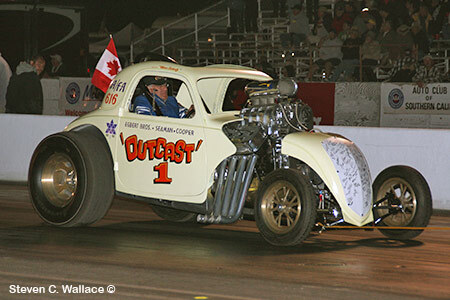 Off to Edmonton International Raceway they went. 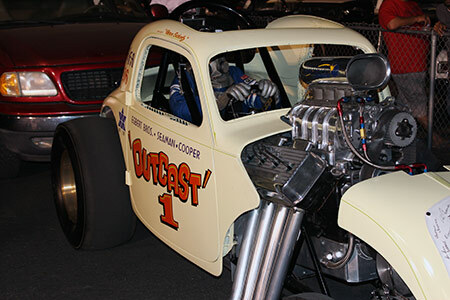 The "Outcast" had a rather inauspicious debut. 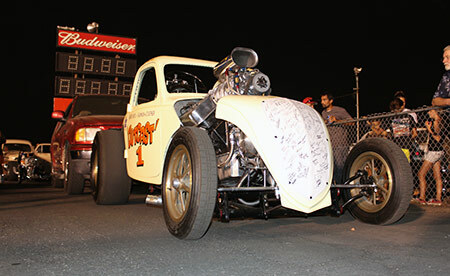 Gary left the line with the tires hazing, things were looking good, smoke, noise, no parts on the ground, but in typical short wheelbase fuel altered fashion the fiat made and abrupt turn into the guardrail. 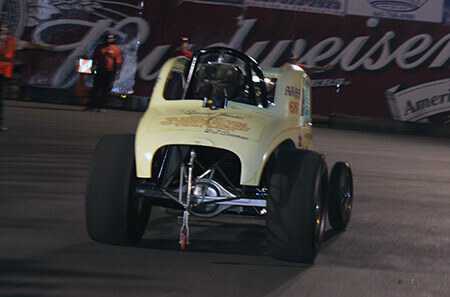 Luckily it was early in the pass, and only minor scrapes were incurred. This was just an omen of things to come. 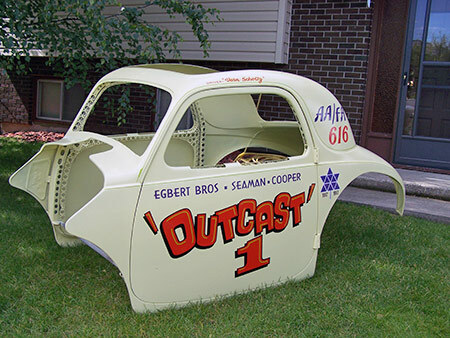 Brent and Gary raced the yellow fiat all over Alberta and Saskatchewan. 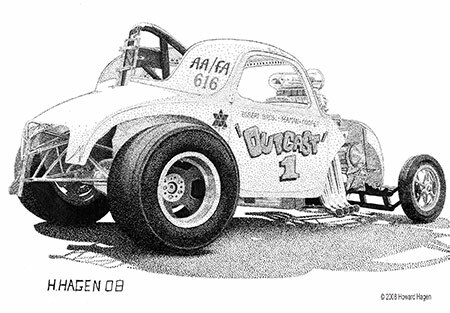 Always a crowd favourite, not only for its cackle and pop, but also for its unpredictability. 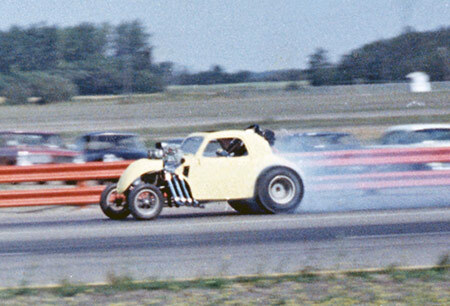 In short, the car was not known for its straight arrow passes. 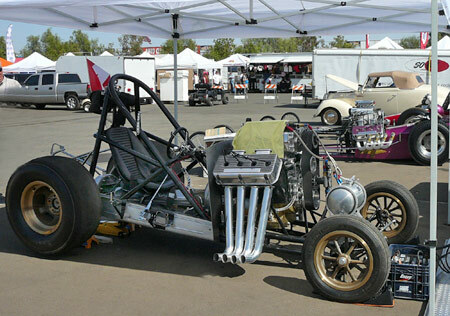 This was the only fuel altered to have been built and raced in Western Canada to date, and perhaps even in Canada. 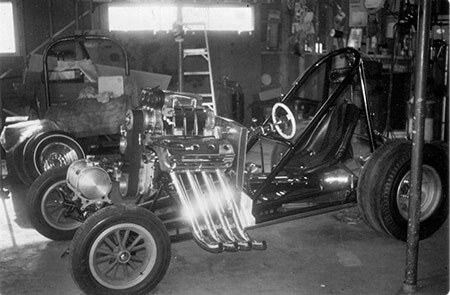 This is the earliest known photo of the car under construction. 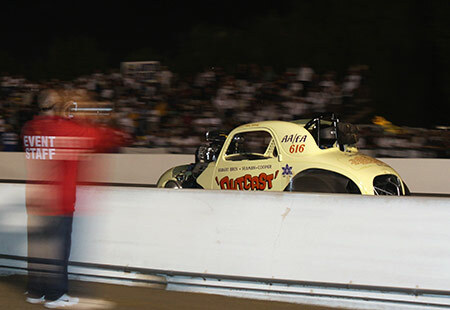 The red is its stock color, the yellow and lettering followed the cars completion. Unfortunately the guys didn't take any photos in the course of its original construction. 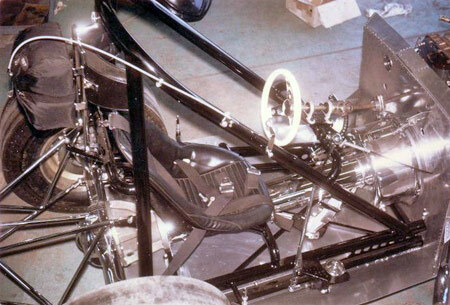 These shots are from 1965 when the car was nearly finised but not yet raced. 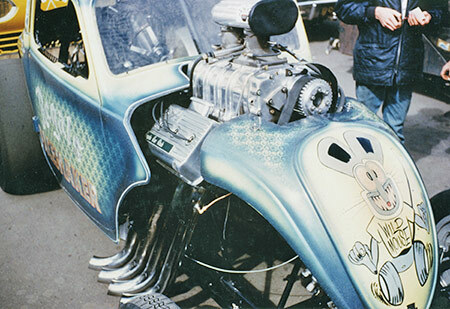 Note all the detail and chrome. 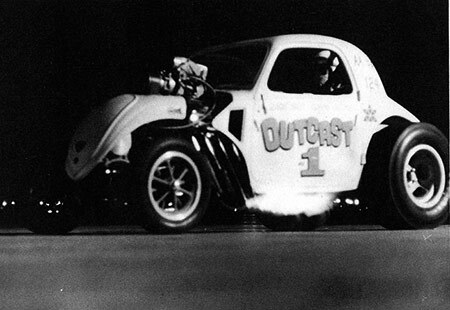 This was over the top for that era. 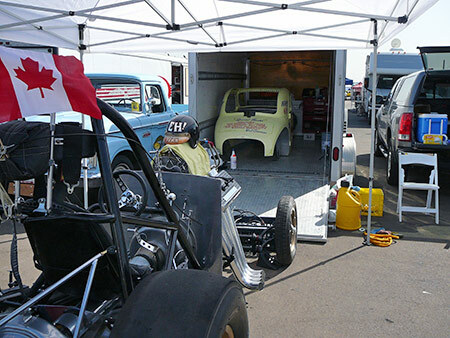 On the trailer in the pits of Edmonton Raceway. 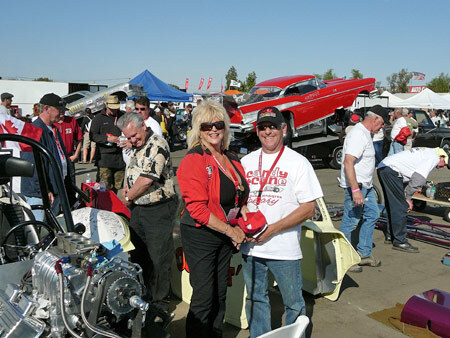 The Regals Car Club bought the Fiat from Brent and Gary. 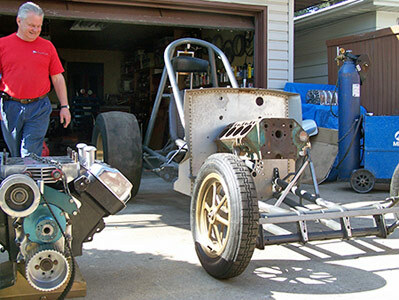 They ran it on gas as a BB/A for a couple of seasons 68 and 69. 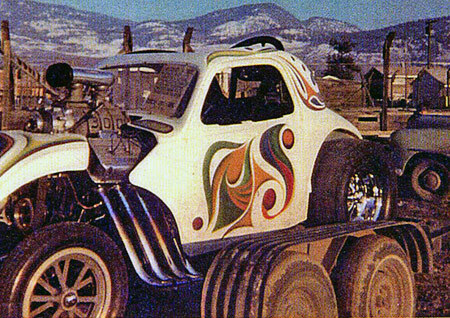 They sold it and it went to Kelowna British Columbia after. 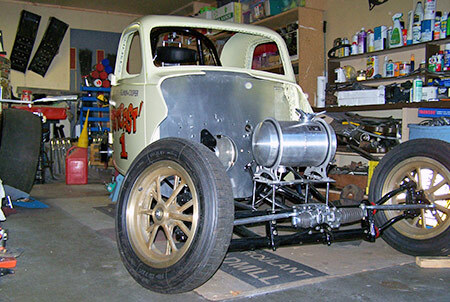 A lot of blood, sweat, and tears have taken place since the little Topolino has come to take residence in my work shop. 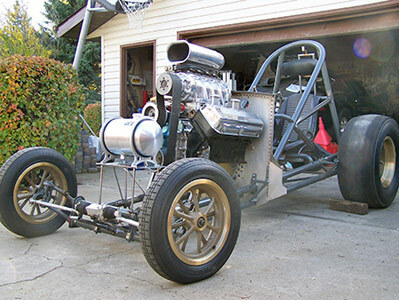 When it first arrived it was an afternoon of throwing ideas about, and mocking up what was to be done. 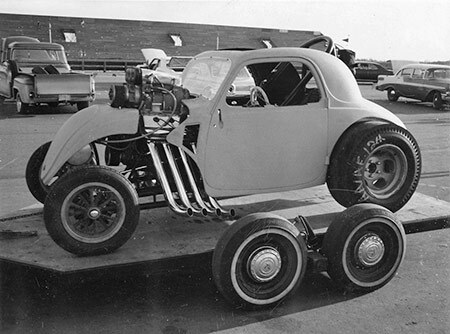 Since the car had been lengthened in a rather slipshod manner the first step was to decide what the wheel base was to be. We settled on a wb of 98 inches, so out came the saw. 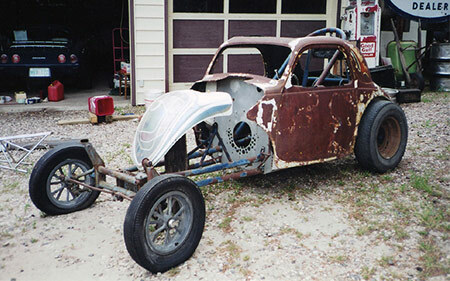 Once the front axle was made to look better than a stock VW front end it was then lined up and welded to the frame rails. 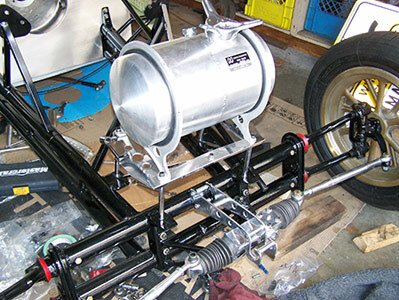 When the Fiat was first built the VW torsion bar suspension was left, now in the rebuild it was decided to make the axle a no suspension unit. 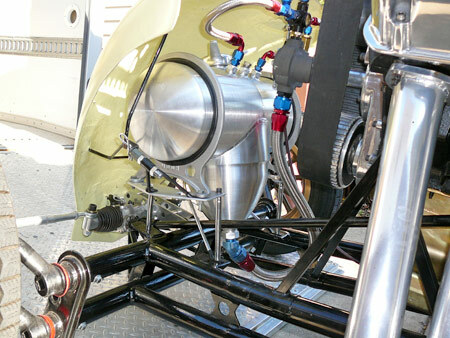 This would eliminate any bump steer when the throttle was hit. 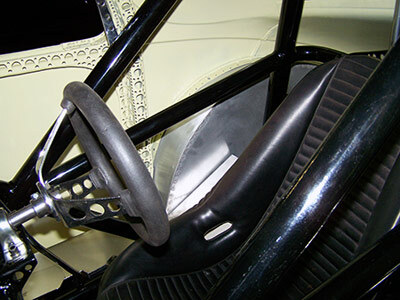 This was one of the reasons that the car was so twitchy when it was run as an AA/FA back in the day. 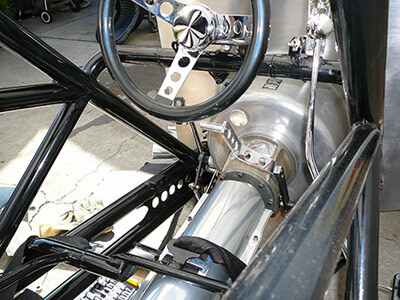 Now the steering will remain constant with no suspension travel to induce a steering problem. 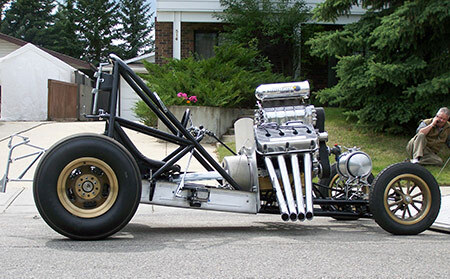 Who need suspension in a short ride any ways! 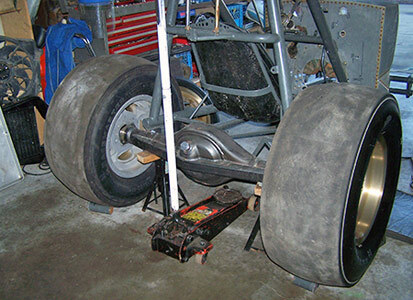 With the front end on it was time to put on the front wheels and tires so the ride height could be determined. 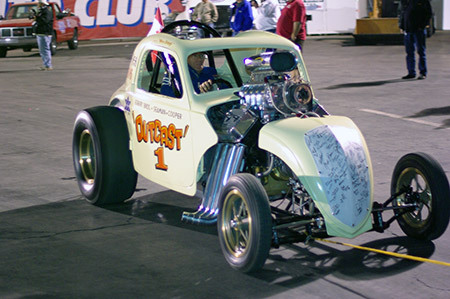 Not only was the decision made to make it a solid front end , a caster angle of 18 degrees was done along with dropping the front of the car almost six inches from its original ride height. 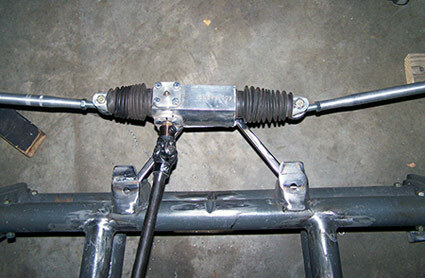 In the rear a small problem arose in that the axle bolt pattern was not the same as the wheel bolt pattern. 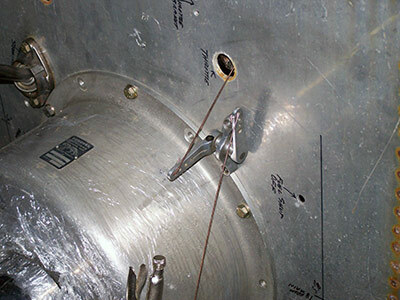 A trip to the machine shop solved this small problem. 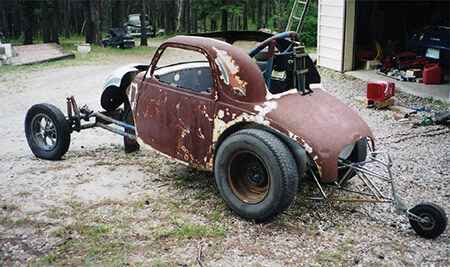 After many years the Fiat had its front and rear wheels on again. 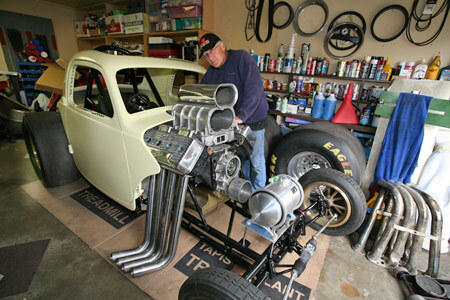 Brent had huge smile on his face when the Fiat rolled out of the shop. 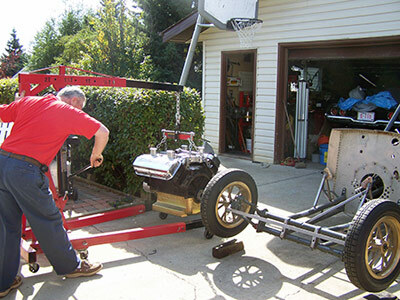 The next step was a week later as Brent brought over the 392 blown Chrysler to install in to the rolling chassis. 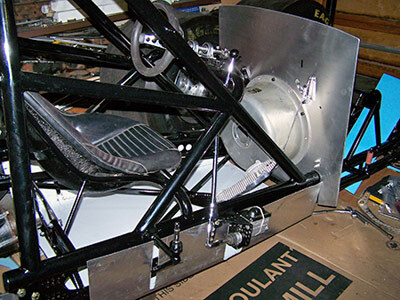 This was a day that brought a tear to Brent's eye when we set the engine into the chassis, and were finally able to see what the car would look like. Brent spent the better part of the afternoon walking around the car, saying different things, with the most fitting comment being "This Thing is going to look just Bitchin' !" 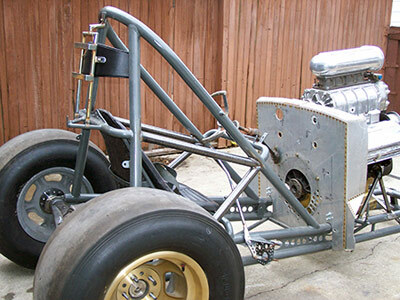 With the engine in place it was up to me to add some bracing and safety items. 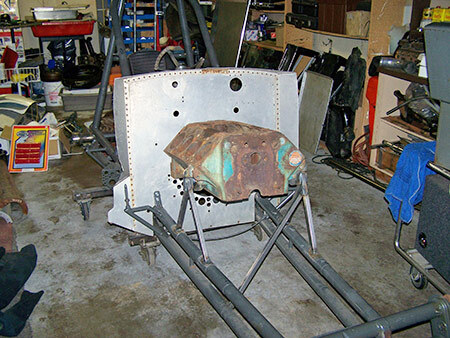 There were a few small repairs on the chassis, and a couple of braces to add. 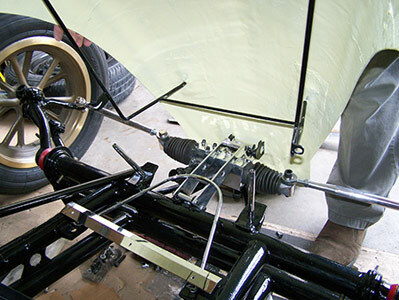 The biggest add on was the s=addition of shoulder bars, and a diagonal to connect the roll bar to the lower frame rails. 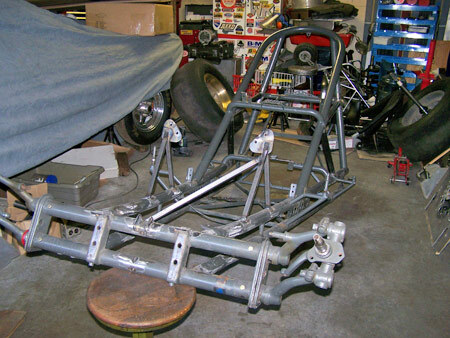 With the bars in place they look like they were there form when it was built, plus it added a big safety edge to the chassis. 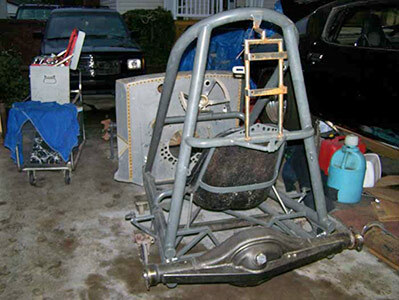 The following weekend Brent brought over the Moon Fuel tank. 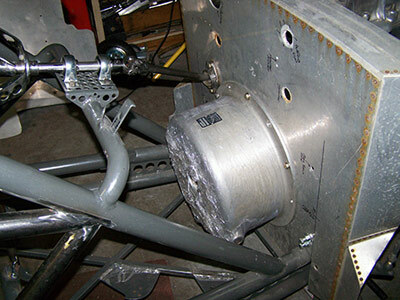 Once a height for the fuel tank was determined, I made up the mounts. 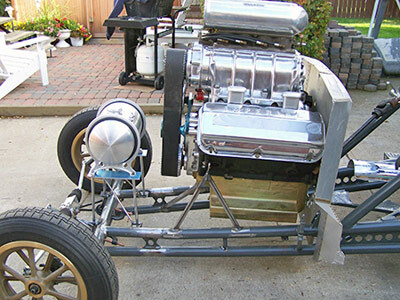 With the fuel tank mounted the car is starting to look better and better,. 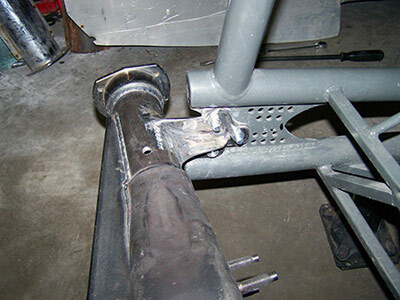 After I had the tank mounted I got busy on mounting the steering rack. 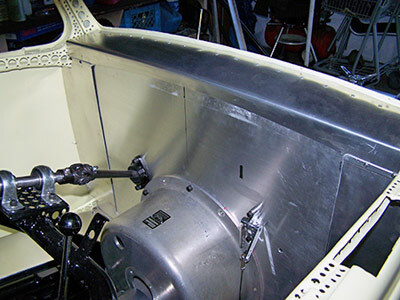 On the original build a Morris Minor rack was used. 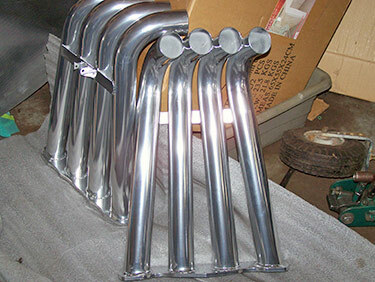 Since the Morris Minor rack had long since disappeared a new aluminum billet rack has been employed. 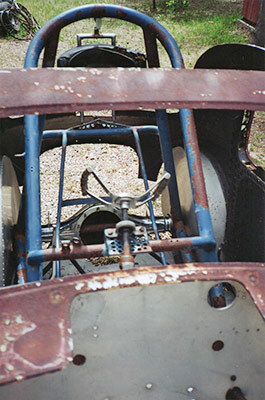 It looks right at home and will be a safer steering arrangement than the original rack was. 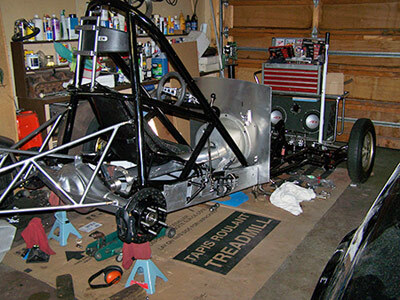 With all the parts and pieces being added it is starting to look like a race car again. 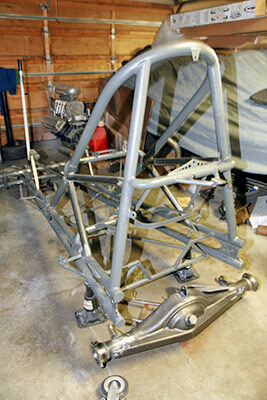 Next will be the headers, steering linkage, aluminum paneling, and the fitting of the body. 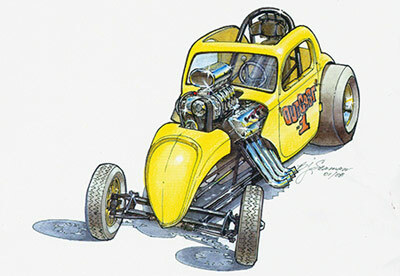 This is Brent Seaman's concept drawing of the car prior to construction. 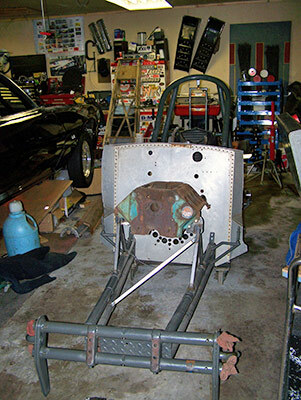 Beginning of restoration , in Vern'sgarage, April 2008. 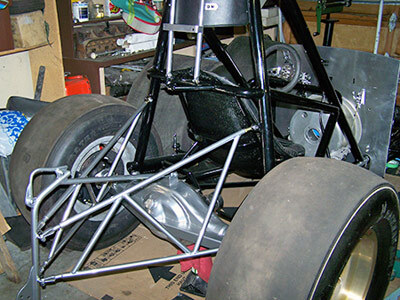 Chassis shortened and front end mounted. 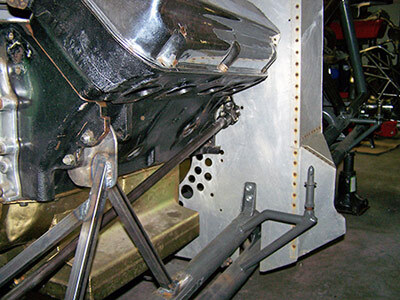 Since the original Pontiac/Olds rear end was missing a Ford 9 inch was mounted. 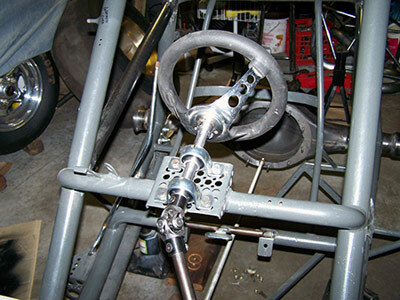 Steering and drive line fitting. 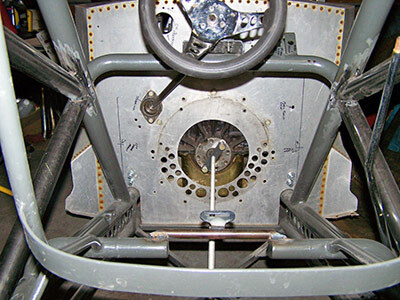 Construction of Steering was like it was back then. 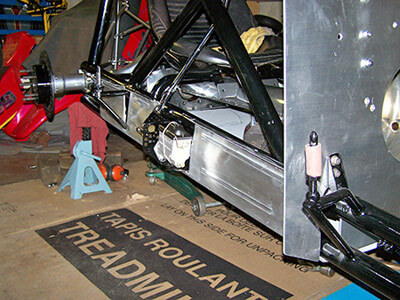 Repaired , remounted front end. 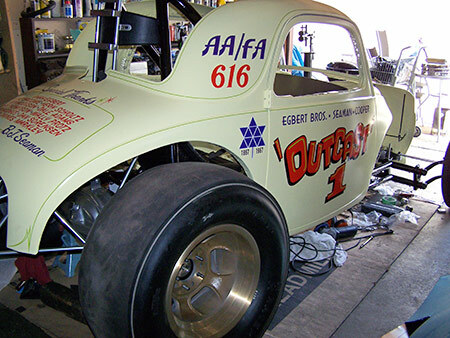 Changes made were, removal of torsion suspension, reversed VW axle, lower than original ,and a longer wheelbase were made to give the car a better look and stance. Original box was from a Morris, this time an aftermarket rack was installed. 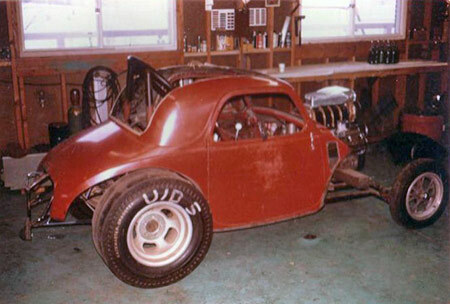 All the polishing was done in Vern's garage by himself. 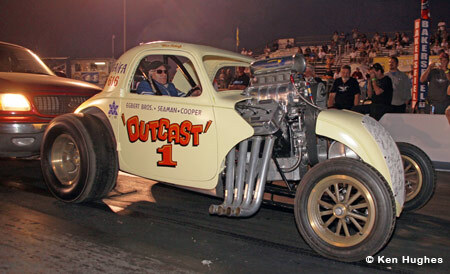 The Cackle motor in the car. 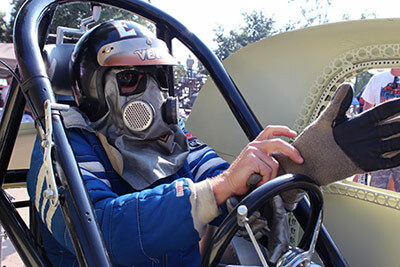 Brent testing out the new seat. 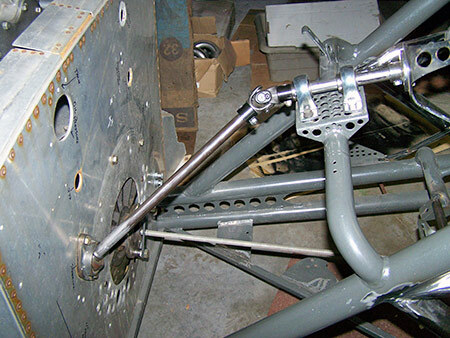 Throttle linkage incorporated original Don Long pieces, courtesy of Dale Adams. 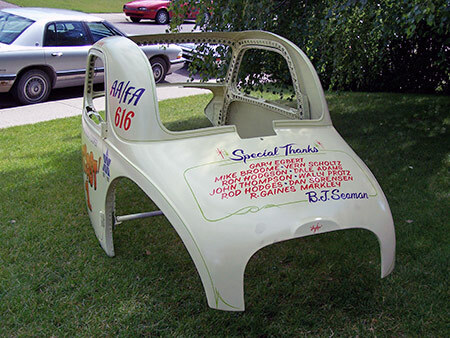 A original, min, unused Donovan can donated by Gaines Markley is in the car. New tin, a little nicer and cleaner than the original. 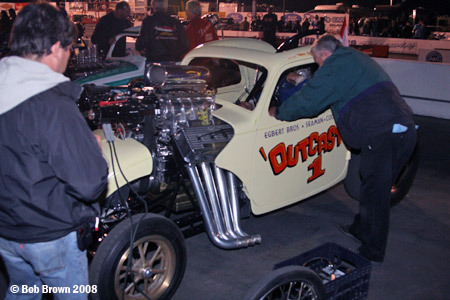 Vern working on the car, fitting headers, originals were copied and built by himself. 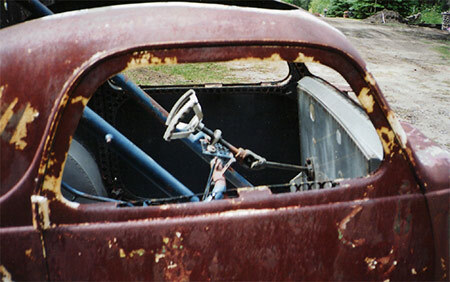 Restored Wheelie wheel and push bar. 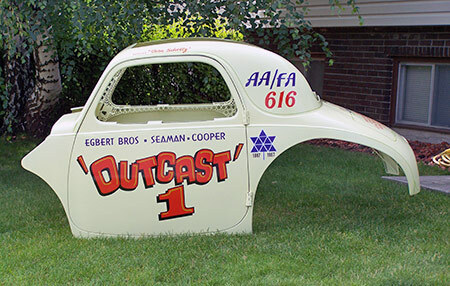 Like most other cacklecars, they put a bigger tank in it than the original due to the better pumps and longer running time. 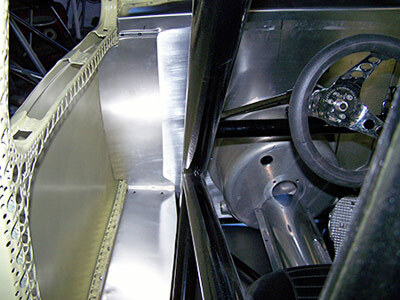 A lot of the car was built outside under this canopy. First time out in Calgary. 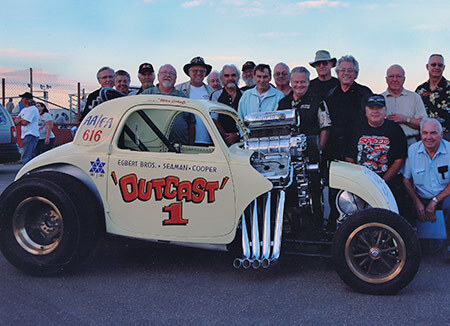 Group shot of a bunch of Northwest players including Jerry Ruth, Herm Peterson and Terry Capp, Dale Armstrong, Wayne King, Ron Hodgson, Gordon Jenner, Gary Eggbert, Brent Seaman, Ken Achs, and Terry Howland. 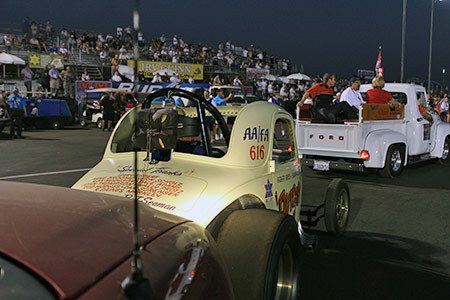 The restoration was debuted at the 2008 CHRR. 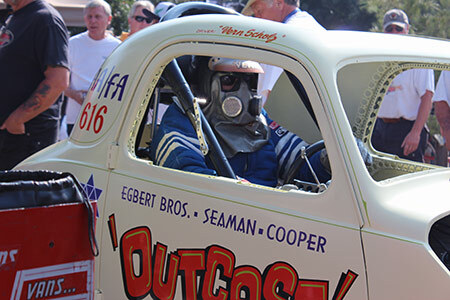 All the way from Edmonton, Alberta, Canada the Egbert Bros. 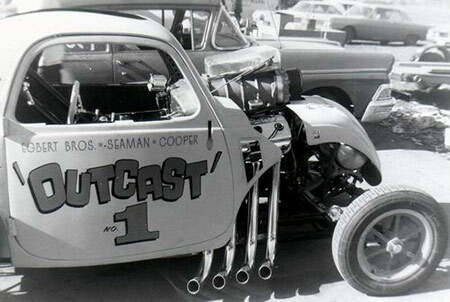 Seaman & Cooper 'Outcast' AA/FA. 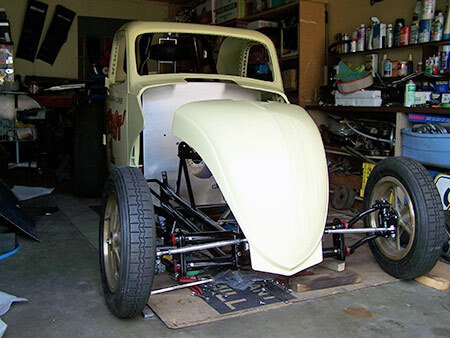 This is a real deal restoration done by B.J. Seaman. 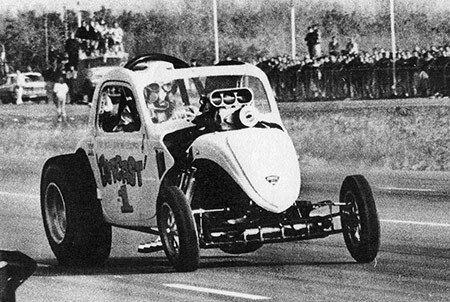 Both he and Egbert went on to field several top fuel cars in the 60s. 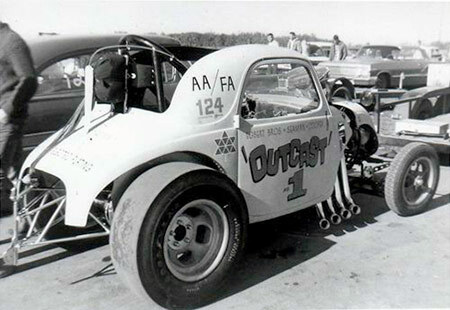 Vern Scholz was in the car. Their first Cacklefest was a static start. 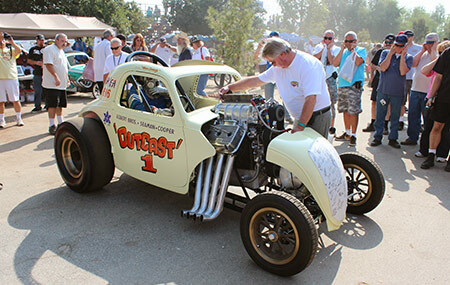 Vowed to come back next time for a push start, and they did. 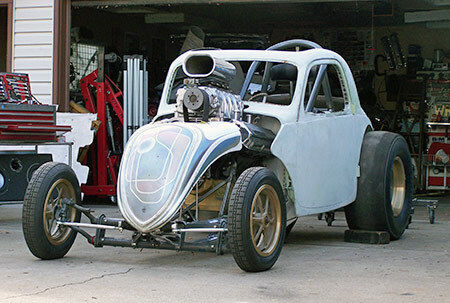 Fast forward to the 2011 California Hot Rod Reuinon. 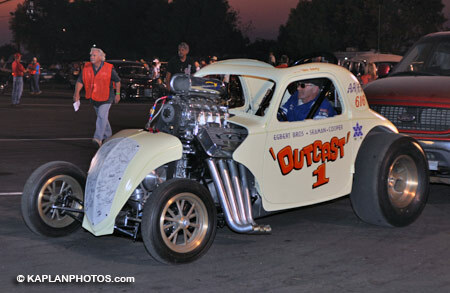 At the 2011 CHRR Vern Scholz was in the car again. 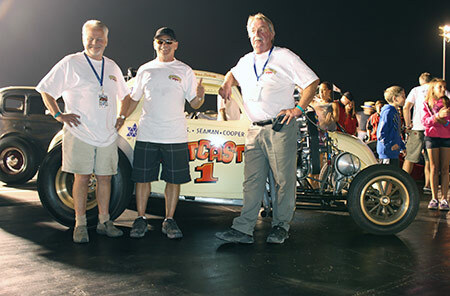 Mike Bromme, Rod Hodges and Brent Seaman - startin' her up. 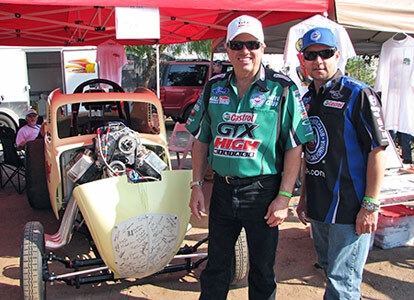 John Force and Robert Hight infront of the Outcast pit. 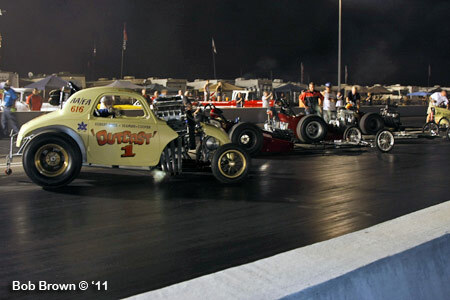 CHRR 2011: "This was our last min thrash in the lanes. 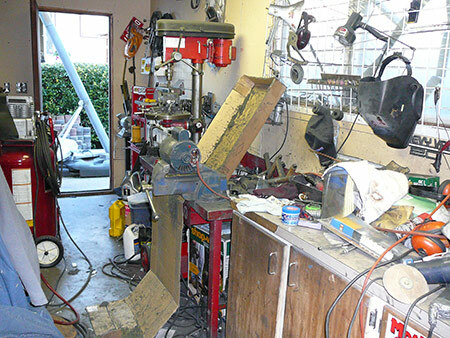 We broke a pump drive in the afternoon, and didn't find a replacement pump until 1/2 hr before the Cacklefest. 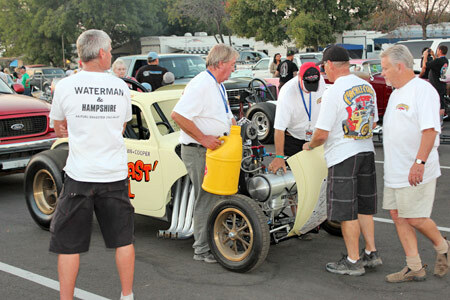 The Pump was found by the dragster guy beside us ( Paradise Alley AA/FD - purple car) , and he found one in the swap meet of all places, so a big thanks to them . If not we would have been out of the show!" 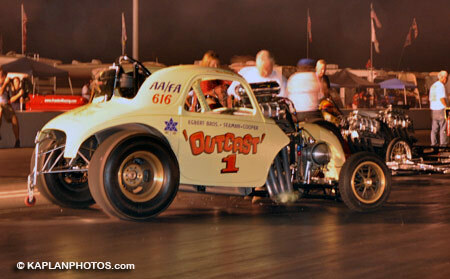 Cacklefest parade is a big thing at the CHRR. 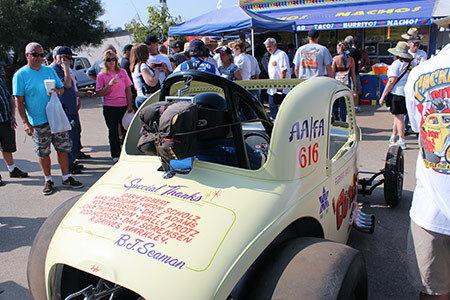 It gives the fans a chance to see all the cars prior to their push start. 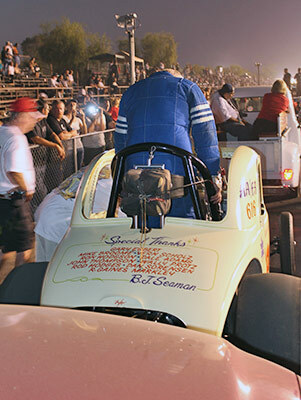 Brent Seaman went out to oversee the engine.